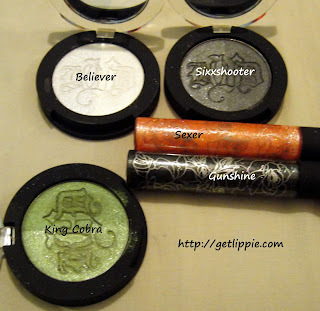 I’ve been doing some swaps with my international readers, and last month, I managed to get hold (in return for a truckload of Barry M) of a set of Kat Von D shadows and lipglosses from Sephora. These are so pretty! I’m not sure if you can pick it up in these shots, but each of these pans has two different textures of shadow, one shimmer, and one matte, meaning you actually have six different shadows, rather than just three. 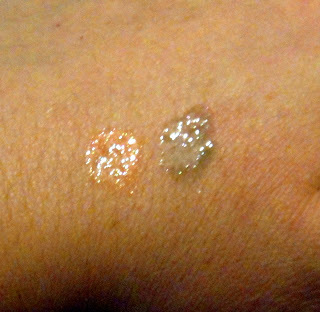 As you can see the two textures are very similar in shade, and intensity, but the shimmery shades do have a more glittery appearance. 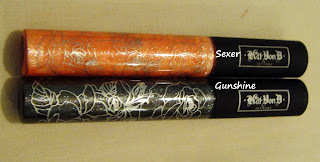 They’re really shimmery, and feel very light, but not gritty on the lips. 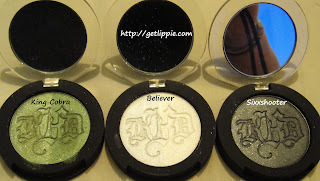 Do you own any Kat Von D? What else should I look out for in Sephora when I have someone passing by? I have some Tarina Tarantino on the way, and I can’t wait for it to arrive! These look so interesting! I adore KVD and am not surprised to see a black lipgloss in the range, although it would be interesting to actually see it applied. Am still swithering whether to get some of the Tattoo Cover-up – saw a behind the scenes of the shoot she did and the cover-up job of her entire tattoo collection was something else! 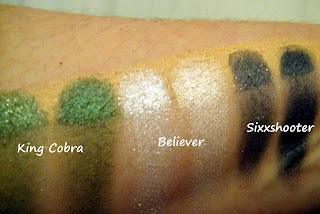 Ooh i really like the idea of matching matte and shimmer colours together, very interesting. The orangey liploss looks lovely. Oh wow, I need to get some US friends! I'm dying to try some Tarina Tarantino. I'm totally a sucker for the packaging.